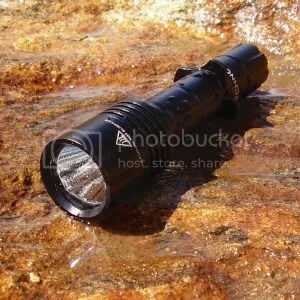 In the last post on the tactical knife I mentioned a flashlight as an essential piece of equipment. Whether you’re travelling with the family or just out for a trip to the mall a flashlight like this can make the difference between being a victim or a survivor. Now that may sound like an exaggeration but hopefully you’ll see my point after you read this and watch the short video. 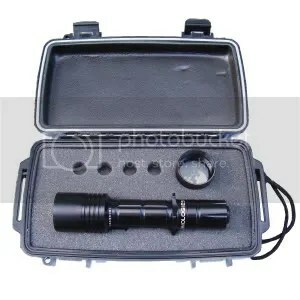 Most people think of a flashlight as a simple tool to light the way when the power goes out or any number of uses. In the world of defense it’s far more when your light is extremely bright and especially so when it has a strobe function. Personal flashlights using recent circuitry innovations operate in several modes. The Hoyt HL-1 is one such light. The specifications and features for the light are listed below. The information listed above sums up the abilities of the light in a literal sense but until you see the very very bright 155 lumen light in darkness you can’t really appreciate it. When used in strobe mode it’s especially impressive. Speaking of strobe lets take a look at a short movie I made. This was done in late afternoon on a cloudy day so it wasn’t even totally dark. One thing you’ll notice is the strobe seems to pause after a few flashes. This is a camera effect. The strobe is fast and constant when viewed with the human eye. The Hoyt HL-1 comes in a thick black plastic case with foam lining. It’s waterproof and holds the light, four extra batteries and a diffusing lens which replaces the standard lense when you want to light up a wider area. This does reduce the “throw” or brightness and distance the light covers. Modes are controlled by the number of clicks specified in the instruction book which is to lengthy to list here. In spite of the long instructions it’s very simple to select the mode of choice. I keep mine in CQC or Close Quarters Combat. 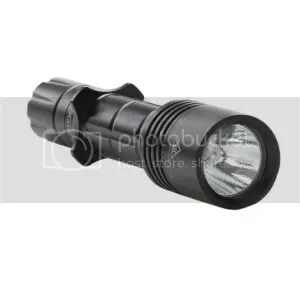 With one click you have the full power 155 lumen light with a double click activating the strobe. Two more clicks turns the light off. The weapon/nav function simply means it’s handheld or weapon mounted using the low power 7 lumen setting to navigate the landscape without letting everyone in the area know you’re there. I imagine you see my point of the importance of a good flashlight with the strobe function. Pointing the light in an attackers face will blind and disorient them badly allowing you more time to draw your handgun or take whatever action you feel is needed. One cautionary tail. When we first starting using strobe lights on our police units we found that a strobe operates on a frequency that will send an epileptic into a seizure. The first and last time this happened to me made the suspect hit the ground in a hurry. You don’t want to play with the light on strobe if a family member or friend is an epileptic! I’ve owned many flashlights over the years. The first was state of the art in the mid 70’s which was a Mag-Lite with three D cell batteries. That was followed by the Streamlight SL-35. These lights served two purposes if you know what I mean:-) Jump forward to a few years ago to retirement and the search was on for a smaller handheld light that could be carried in a Galco mag pouch that held a spare magazine and a flashlight. I won’t bore you with a list of all the lights I tried but suffice it to say I’ve found a keeper in the Hoyt HL-1! Mine is from the great folks at Mounts Plus! 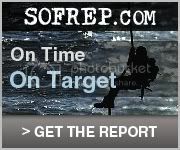 Happy shooting and as always feel free to comment or ask questions you may have!